Pedro Morales was born on Culebra Island, off the coast of Puerto Rico but also spent a lot of his childhood living in Brooklyn, NY..
1959: Pedro debuted at the Sunnyside Gardens beating Buddy Gilbert..
1971: Pedro Morales defeated Ivan Koloff to win the WWWF World Heavyweight title..
September 30, 1972 – Showdown at Shae: Pedro Morales went to a 76 minute draw with WWWF Champion Bruno Sammartino..
August 9, 1980 – Showdown at Shae: Bob Backlund & Pedro Morales defeated The Wild Samoans to win the WWF Tag Titles..
September 22, 1980 – WWF/NWA EVENT: Pedro Morales defeated Wild Samoan Afa..
December 8, 1981: Pedro Morales defeated Ken Patera to win the Intercontinental title..
November 23, 1982: Pedro Morales defeated Don Muraco to recapture the Intercontinental title..
April 2, 1986 – WrestleMania II: Pedro Morales participated in the “Battle Royal” which was won by Andre the Giant..
1986: Pedro Morales started teaming regularly with Tito Santana and had a feud with The Islanders..
July 12, 1986 – MSG Network: Pedro Morales defeated Iron Mike Sharpe. July 14, 1986 – King Of The Ring: Pedro Morales defeated Rudy Diamond in the 1st round. Pedro Morales defeated Mike Rotundo in the quarter-finals. Pedro Morales defeated Nikolai Volkoff in the semi-finals. Harley Race defeated Pedro Morales to win the King Of The Ring tournament. July 18, 1986 – House Show: Pedro Morales defeated Jim Neidhart. August 17, 1986 – House Show: Pedro Morales defeated Terry Gibbs. August 28, 1986 – The Big Event: Harley Race defeated Pedro Morales. August 30, 1986 – House Show: Pedro Morales defeated Hoss Funk. October 8, 1986 – House Show: Kamala defeated Pedro Morales. October 10, 1986 – House Show: Bob Orton defeated Pedro Morales. October 12, 1986 – Wrestling Challenge: Pedro Morales & Tito Santana defeated Ken Glover & Steve Lombardi. October 17, 1986 – House Show: Pedro Morales defeated The Red Demon. October 23, 1986 – House Show: Pedro Morales defeated Siva Afi. October 25, 1986 – Superstars: Nikolai Volkoff & The Iron Sheik defeated Pedro Morales & Tito Santana. November 2, 1986 – Wrestling Challenge: The Hart Foundation (Bret Hart & Jim Neidhart) vs. Pedro Morales & Tito Santana ended in a double count-out. November 16, 1986 – Wrestling Challenge: Pedro Morales & Tito Santana defeated John Jackson & Steve Regal. November 22, 1986 – Superstars: Johnny V & The Dream Team (Brutus Beefcake & Greg Valentine) defeated Hillbilly Jim, Pedro Morales & Tito Santana by disqualification. November 22, 1986 – House Show: Pedro Morales defeated Jack Kruger. November 24, 1986 – MSG Network: Hercules Hernandez defeated Pedro Morales. November 28, 1986 – House Show: Pedro Morales defeated Steve Lombardi. December 2, 1986 – House Show: Pedro Morales defeated Jimmy Jack Funk. December 3, 1986 – House Show: Pedro Morales defeated Rene Goulet. December 7, 1986 – Wrestling Challenge: Hillbilly Jim, Pedro Morales & Tito Santana defeated Barry O, Brian Costello & Iron Mike Sharpe. December 12, 1986 – House Show: King Harley Race defeated Pedro Morales. December 13, 1986 – Superstars: Hillbilly Jim, Pedro Morales & Tito Santana defeated Barry O, Moondog Spot & The Raider. December 26, 1986 – MSG Network: Pedro Morales defeated Dino Bravo by disqualification. December 28, 1986 – House Show: Pedro Morales defeated Tiger Chung Lee. Pedro Morales defeated The Red Demon. January 3, 1987 – Saturday Night’s Main Event: Hercules defeated Pedro Morales in a dark match. January 9, 1987 – House Show: Pedro Morales defeated The Magnificent Muraco. January 18, 1987 – Wrestling Challenge: Dino Bravo & The Dream Team (Brutus Beefcake & Greg Valentine) defeated Hillbilly Jim, Pedro Morales & Tito Santana by count-out. January 31, 1987 – Superstars: Pedro Morales & Tito Santana defeated Nikolai Volkoff & The Iron Sheik by disqualification. February 8, 1987 – House Show: Dino Bravo defeated Pedro Morales. February 12, 1987 – House Show: Jake Roberts defeated Pedro Morales. February 13, 1987 – House Show: Pedro Morales defeated Moondog Spot. February 21, 1987 – House Show: Pedro Morales defeated Iron Mike Sharpe. February 23, 1987 – MSG Network: The Honky Tonk Man defeated Pedro Morales. February 26, 1987 – House Show: Pedro Morales defeated Sika. July 10, 1987 – House Show: The One Man Gang defeated Pedro Morales. July 11, 1987 – House Show: Pedro Morales defeated Frenchy Martin. July 17, 1987 – House Show: Paul Orndorff defeated Pedro Morales. Pedro Morales took a job as a Spanish Announcer in the WWF for a while before retiring from the business. Pedro Morales was the first wrestler win the Tag Team, Intercontinental & World titles in the (W)WWF(E)..
June 18, 2005: Pedro Morales did what is billed as his first ever autograph session in Cartaret, NJ. 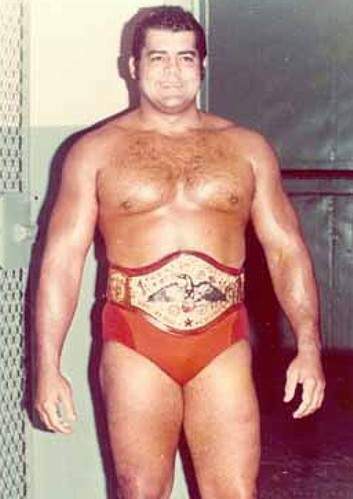 February 12, 2019: Pedro Morales has passed away at the age of 76.